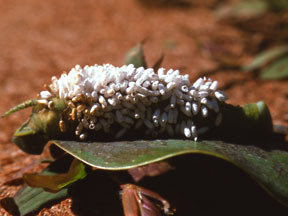 The Ichneumonoidea comprises a huge group (over 100,000 estimated species worldwide) of primarily parasitoid insects that attack other arthropods, especially the immature stages of other insects (Gauld and Bolton, 1988; Wahl and Sharkey, 1993). 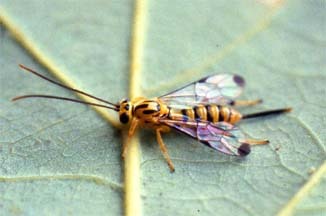 A few taxa are secondarily phytophagous, and several groups that attack egg masses or food provisions of other arthropods are difficult to classify as either "parasitic", predaceous or parasitoid. The species of Ichneumonoidea vary tremendously in size, from approximately 1 mm in length to 5-6 cm (even larger if the ovipositor of some larger species is included). The superfamily currently is considered to contain two extant families, Braconidae and Ichneumonidae, as well as one fossil family (Eoichneumonidae), and a fossil genus, Tanychora, of uncertain relationship to the other families (Sharkey and Wahl, 1992). Past classifications have sometimes included other groups, such as Stephanidae and Megalyridae, now transferred elsewhere, or they have recognized subfamilies of Braconidae (e. g. Aphidiinae and Apozyginae) and Ichneumonidae (Agriotypinae and Paxylommatinae) as distinct families. Ichneumonoidea have been present since at least the early Cretaceous, being represented by Tanychora from Transbaikalia (Townes, 1973), as well as several genera of Eoichneumonidae from Australia, Siberia and Mongolia (Jell and Duncan, 1986; Rasnitsyn and Sharkey, 1988). The placements of the early Cretaceous Praeichneumon townesi as an ichneumonoid and of Eobracon inopinatus as a braconid (Rasnitsyn, 1983) have been questioned recently (Sharkey and Wahl, 1992; Whitfield, 2002); nevertheless it is clear that the superfamily was still represented at least by extinct groups from the very early Cretaceous. Sharkey and Wahl (1992) presented the first real cladistic analysis of the fossil and extant families; their tree is represented on this page as the reference tree. Readers may also want to consult the more recent analyses and discussions of Quicke et al. (1999) for a more updated (if slightly more phylogenetically inconclusive) review. Gauld, I. and B. Bolton. 1988. The Hymenoptera. British Museum (Natural History) and Oxford Univ. Press. Jell, P. A. and P. M. Duncan. 1986. Invertebrates, mainly insects, from the freshwater, Lower Cretaceous, Koonwarra Fossil Bed (Korumburra Group), South Gippsland, Victoria. Mem. Assoc. Australas. Paleaont. 3: 111-205. Quicke, D. L. J., H. H. Basibuyuk, M. G. Fitton and A. P. Rasnitsyn. 1999. Morphological, palaeontological and molecular aspects of ichneumonoid phylogeny (Hymenoptera, Insecta). Zool. Scripta 28: 175-202. Rasnitsyn, A. P. and M. J. Sharkey. 1988. New Eoichneumonidae from the early Cretaceous of Siberia and Mongolia (Hymenoptera: Ichneumonoidea). Pp. 169-197 in: Gupta, V. K., ed., Advances in Parasitic Hymenoptera Research, E. J. Brill, Leiden. Townes, H. 1973. Two ichneumonids (Hymenoptera) from the early Cretaceous. Proc. Entomol. Soc. Wash. 75: 216-219. Wahl, D. B. and M. J. Sharkey. 1993.Superfamily Ichneumonoidea. Pp. 358-509 in: Goulet, H. and J. T. Huber, eds., Hymenoptera of the World: An Identification Guide to Families, Agriculture Canada, Ottawa. Whitfield, J. B. 2002. Estimating the age of the polydnavirus/braconid wasp symbiosis. Proc. Nat. Acad. Sci. USA 99: 7508-7513. Page: Tree of Life Ichneumonoidea. Authored by James B. Whitfield. The TEXT of this page is licensed under the Creative Commons Attribution License - Version 3.0. Note that images and other media featured on this page are each governed by their own license, and they may or may not be available for reuse. Click on an image or a media link to access the media data window, which provides the relevant licensing information. For the general terms and conditions of ToL material reuse and redistribution, please see the Tree of Life Copyright Policies.